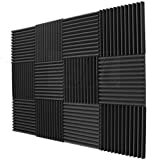 12 Pack Acoustic Panels Studio Foam Wedges 1" X 12" X 12"
Jan 06, 2017: Will these acoustic panels stop sound emitted from room and that coming from the outside? Mar 10, 2017: Noob question about soundproofing. Jun 08, 2017: Help with possible echo issue. Aug 29, 2017: Sound proofing windows? Aug 30, 2017: Window soundproofing? Oct 07, 2017: How do you stop sound from escaping a room? Mar 08, 2018: Using canvas prints to reduce echo and improve acoustics in an open room with lots of walls and tile floor? Apr 19, 2019: Advice on where to put soundproofing panels?